The first stop on his visit to the county was Carlisle's Pirelli Factory where he celebrated their 50th anniversary. Amy Wright and Heather Hall, of the Usual Place Community Cafe in Dumfries, will attend Prince Harry and Meghan Markle's big day on Saturday 19 May. Kimberley Watkin and Adam Hughes from Carlisle will also be attending, for their work beneath Carlisle Railway Station. They are one of 1,200 members of public, from across the country, who have been invited to the big day. 26-year-old Amy Wright from Annan, of the Usual Place Community Cafe, will attend Prince Harry and Meghan Markle's big day on 19 May. Two people in our region have been invited to the royal wedding of Prince Harry and Meghan Markle. Kimberley Watkin and Adam Hughes will represent Carlisle Undercroft at Windsor Castle on Saturday 19 May. Our invite recognises the ‘strength of our contribution to the local community’ and we are humbled and excited to have been chosen to attend." 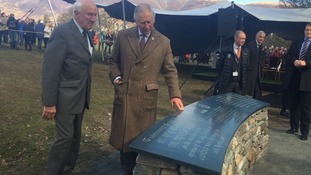 The Prince of Wales will be guest of honour at a community event today to mark the Lake District receiving World Heritage Site status. A number of people across Cumbria and southern Scotland have been chosen to receive a UK Honour in 2018.